Pat Kelly, a retired Durango Fire Department captain, looks through the 1982 Seagrave fire engine on Friday that he road in responding to emergencies during his career with the department. Durango Fire Protection District has decided to take the truck out of service. 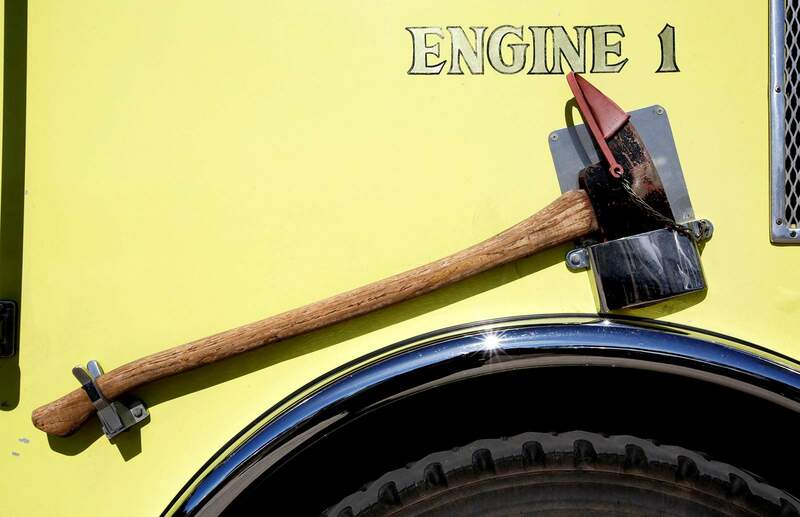 The 1982 Seagrave fire engine on Friday will be retired by Durango Fire Protection District after many years of service. 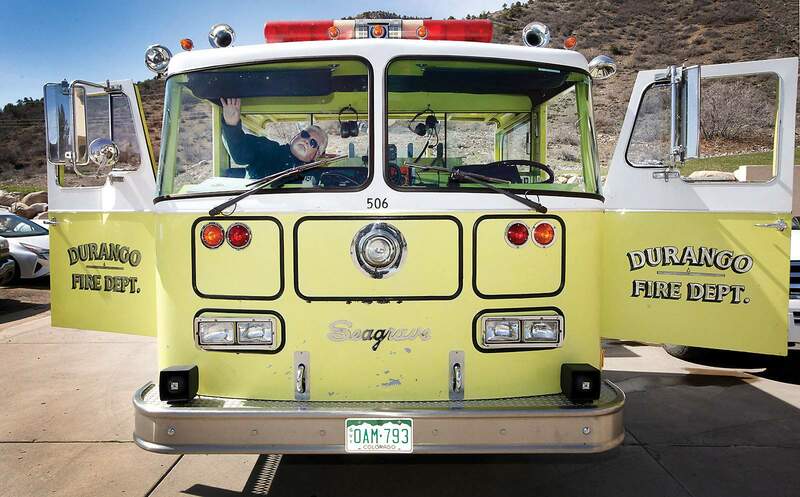 Jim Harris, battalion chief, with Durango Fire Protection District, talks about the 1982 Seagrave fire engine on Friday and how fire fighting trucks have changed over the years. The department has decided to take the truck out of service. A firetruck is much more than just six wheels, sirens and a water hose – it “becomes a piece of us,” said retired Durango Fire Department Capt. Pat Kelly. And one piece of Kelly, the 1982 Seagrave Durango Fire Engine 1 he rode for eight years before retiring with an injury, is about to move on. It’s an old truck, painted lime green to be more visible at night. Its decals are fading. Durango Fire Protection District Battalion Chief Jeff Harris admits it’s not pretty, but it is functional. The Seagrave engine rolled into Durango in 1982 – the first automatic transmission firefighting truck for the department. It drove “like a Cadillac,” Kelly said. But it didn’t have all the “bells and whistles,” and it wasn’t top of the line, Kelly said. The fire department was smaller then, serving only residents within city limits, and didn’t have a lot of money, Kelly said. Durango Fire Protection District now serves people all over La Plata County. The “fairly short” engine – about 28 to 30 feet long, Harris said – carries 500 gallons of water, hundreds of feet of hose and seven firefighters. Three ride in the enclosed cab, two sit in an open-air cab and two stand on the back. It can pump 1,250 gallons of water per minute. Modern firetrucks carry 1,000 gallons of water, provide an enclosed cab for everyone on board and pump 1,500 gallons of water per minute. Two axes are strapped to the side of the Seagrave, and a light in front of the vehicle that Kelly calls the “third eye” wobbles and turns to alert drivers the truck is headed their way. There’s a white deck gun, what the old-timers used to call a “turret,” Harris said, on top of the truck. A tank installed in the early 2000s mixes fire-retarding foam with water, a modern firefighting technique developed in 1999. And each compartment in the rear of the truck is designated for certain items: Oxygen packs were stored upside down in a locker near the top of the rear driver’s side of the truck; hose connectors and nozzles were stored in a compartment near the bottom of the rear passenger side of the engine. With the turn of a knob to engage the batteries, a flip of a master switch, then ignition switch, and a push of a button, the diesel engine roars to life. The tachometer shakes with the rumble of the engine. A generator stored on top of the truck wobbles as it takes corners and bumps in the road. The engine emits a baritone groan as it cycles through gears, spitting clouds of exhaust out the rear passenger side. The sirens wail in high octaves, the horn bellows. The firefighters in the open-air cab sat next to the engine compartment, which kept them warm in the winter and baked them in the summer, Harris said. All the noise took its toll, Kelly said. The sirens are mounted on top of the cab – modern trucks mount sirens in the front of the cab – and can produce deafening decibels. Kelly now wears hearing aids in both his ears after more than a decade of abuse. And although the engine left him with hearing problems, it also got him to where he needed to go, lit his way and brought him home safe. The truck got firefighters to the scene within five minutes of receiving a call for decades, Kelly said. It’s run countless calls – records are either buried or lost, Harris said. Now, the compartment bays are empty. The engine is seldom used. 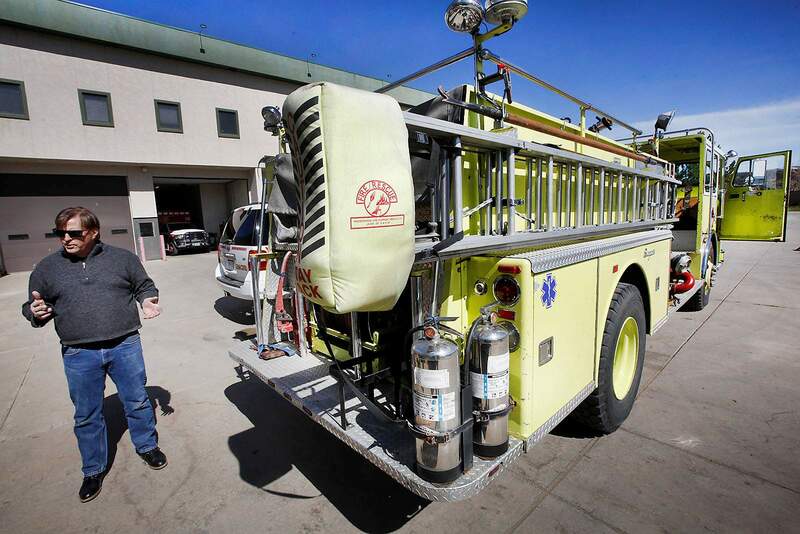 But after the Durango Fire Protection District retires Engine 1 this summer, the Fort Lewis Mesa Fire Protection District will put the engine to work.